Rhys Hoskins spent the last three days playing left field at Triple-A Lehigh Valley in preparation for joining the Phillies at Citizens Bank Park for their upcoming homestand, which begins tonight against the New York Mets. Rhys Hoskins, leading the International League in home runs and OPS, will be promoted to the major leagues prior to tonight's game at Citizens Bank Park against the New York Mets, a Phillies source confirmed on Thursday morning. 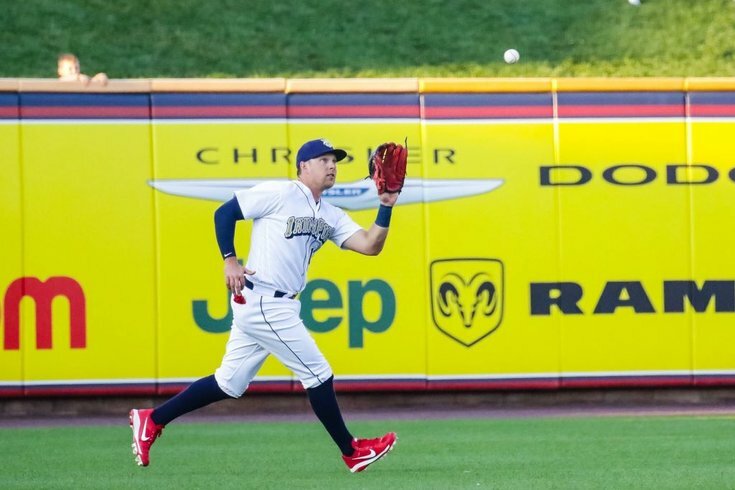 The 24-year-old Hoskins, a natural first baseman, has spent the last three games patrolling left field for Triple-A Lehigh Valley, a position he has spent the previous two weeks working out during batting practice in preparation for his first big league audition. With Aaron Altherr sidelined for the second time in the last two months with a hamstring injury, the Phillies have an opening for a bat in their lineup in the outfield. The Phillies made the news official on Thursday afternoon. The plan – for now – is to play Hoskins and first baseman Tommy Joseph in the same lineup. Although both are natural first baseman, the plan is a sound one at this juncture in the Phillies season for a number of reasons. Hoskins hit .284/.385/.581 with 29 home runs, 24 doubles, and 91 RBI in 112 games with the IronPigs this season. He struck out 75 times and had 64 walks in 475 plate appearances. Hoskins was the Phillies fifth-round pick in the 2014 draft. And before the "Hoskins should be batting cleanup" pitchfork-holding folks come out this afternoon, know that it's not abnormal for top prospects to hit in the lower third of the order in their MLB debuts. Just ask Aaron Judge, Bryce Harper, and Mike Trout – one of them hit ninth in his first big league game. Here is the actual lineup. (I was close). MLB.com first reported Hoskins' call-up on Thursday morning.